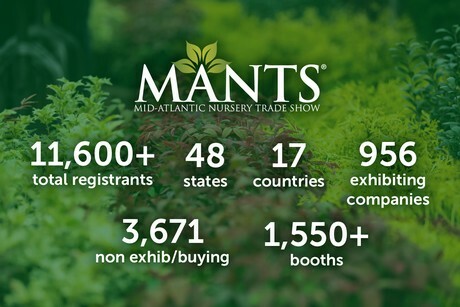 The Mid-Atlantic Nursery Trade Show (MANTS) celebrated another successful event January 9 – 11, 2019 with increased attendee numbers and the debut of innovative new products on the show floor. A diverse group of green industry professionals traveled from across the country and several continents to gather in Baltimore for the show’s 49th year. MANTS will be celebrating its 50th anniversary as the Masterpiece of Trade Shows in 2020; the event is scheduled for January 8-10, 2020 at the Baltimore Convention Center. Founded in 1970 with 64 original exhibitors, MANTS is now one of the largest private trade shows serving the Horticulture Industry and the premier green industry marketplace for finding plants and nursery stock, landscape and garden items, heavy and light duty equipment, tools, furniture and hundreds of other allied industry products. For more information, visit www.mants.com or call (410) 296-6959.